Biotinylated Human Glypican 3, His Tag, Avi Tag (GP3-H82E5) is expressed from human 293 cells (HEK293). It contains AA Gln 25 - His 559 (Accession # P51654-1). The protein has a calculated MW of 64.5 kDa. The protein migrates as 42 kDa(caused by a furin cleavage site) and 70-250 kDa under reducing (R) condition (SDS-PAGE) due to glycosylation. Biotinylated Human Glypican 3, His Tag, Avi Tag on SDS-PAGE under reducing (R) condition. The gel was stained overnight with Coomassie Blue. The purity of the protein is greater than 85%. Immobilized Human FGF basic, Tag Free (Cat. No. 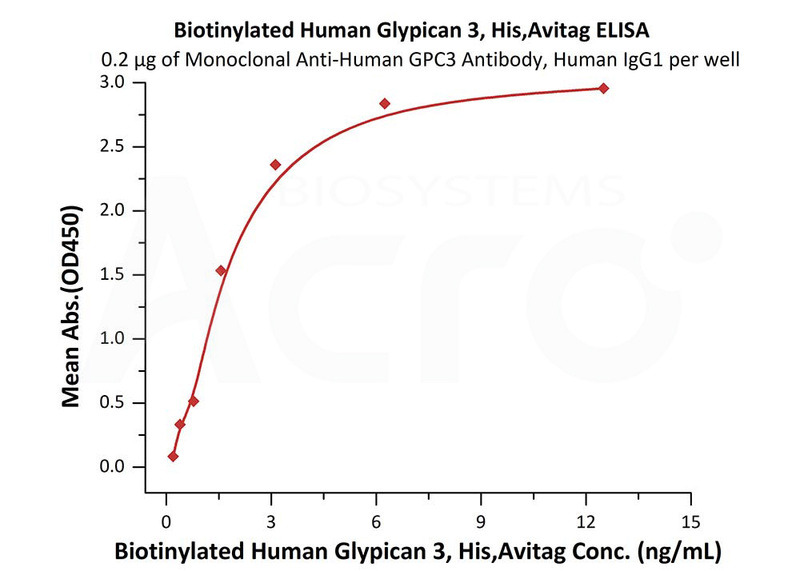 BFF-H4117) at 2 μg/mL (100 μL/well) can bind Biotinylated Human Glypican 3, His Tag, Avi Tag (Cat. No. GP3-H82E5) with a linear range of 1-16 ng/mL (QC tested). 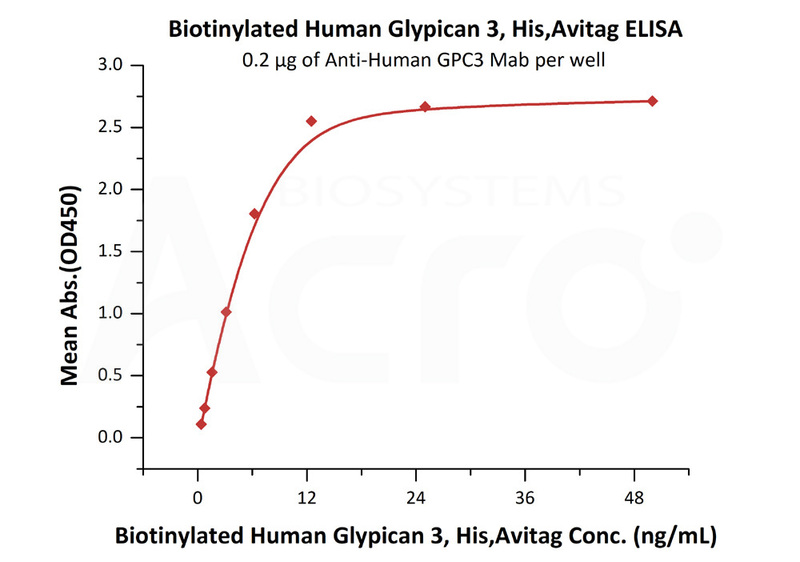 Immobilized Anti-Human GPC3 Mab at 2 μg/mL (100 μL/well) can bind Biotinylated Human Glypican 3, His Tag, Avi Tag (Cat. No. GP3-H82E5) with a linear range of 0.4-6 ng/mL (Routinely tested). 293 cells were transfected with anti-GPC3-scFv and RFP tag. 2e5 of the cells were first stained with B. biotinylated human Glypican 3 / GPC3 protein, His Tag, Avi Tag (Cat. No. GP3-H82E5, 10ug/ml) and C. biotinylated protein control, followed by FITC-conjugated streptavidin. A. Non-transfected 293 cells and C. biotinylated protein control were used as negative control. 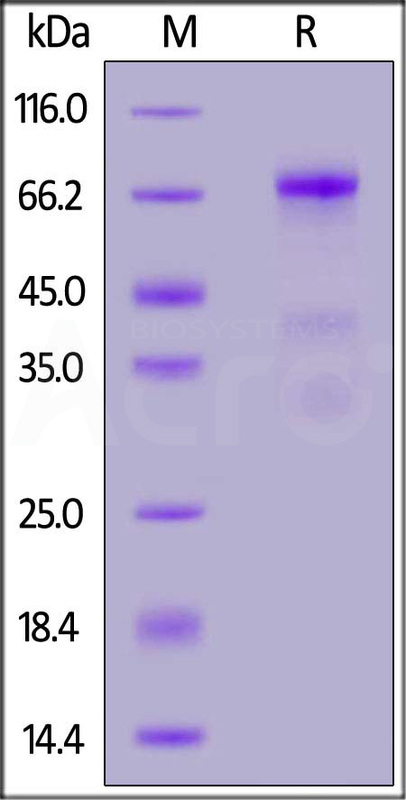 RFP was used to evaluate CAR (anti-GPC3-scFv) expression and FITC was used to evaluate the binding activity of biotinylated human Glypican 3 / GPC3 protein, His Tag, Avi Tag (Cat. No. GP3-H82E5). Glypican-3 (GPC3) is also known as Intestinal protein OCI-5, GTR2-2, MXR7, which belongs to the glypican family. Glypican 3 / GPC-3 is highly expressed in lung, liver and kidney. Glypican-3 inhibits the dipeptidyl peptidase activity of DPP4. Glypican-3 may be involved in the suppression/modulation of growth in the predominantly mesodermal tissues and organs, and also may play a role in the modulation of IGF2 interactions with its receptor and thereby modulate its function. (1) Davoodi J., et al., 2007, Proteomics 7:2300-2310. (2) Veugelers M., et al., 2000, Hum. Mol. Genet. 9:1321-1328.